So, what’s this crazy idea that may not be so crazy after all? 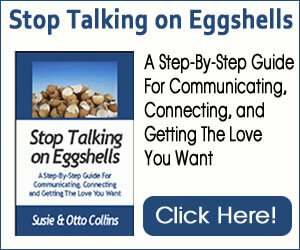 Almost everything you could do to shift, change or improve your relationship or marriage–especially when there are communication, trust and jealousy issues–requires you to act from a place inside you that is probably counter-intuitive. What works best to heal communication, trust or jealousy issues and create closer and more heart-centered connections with our intimate partners doesn’t always seem like it is the “normal and natural” thing to do. Once you start doing some of these things that are “counter-intuitive” and “different” from what you would normally do in situations– the results in your relationships and life are usually so positively profound and noticeable that there’s usually no going back. One of our readers wrote to tell us that she took our suggestion and simply started meeting her husband at the door when he came home from work, giving him a big kiss and telling him she loves him–and it’s made a huge difference in their relationship. Meeting your partner at the door and telling him or her that you love them has become counter-intuitive (we don’t naturally do it) because we’re all busy and we don’t want to interrupt what we’re doing just because our partner comes in the door. But if you do this one simple thing, you will build and rebuild your connection with each other daily. We’ve found that jealousy and trust problems happen much of the time (when the partner isn’t blatantly violating agreements) because the jealous person has been cheated on in the past, can’t forget and is constantly on guard waiting for IT to happen again. Communication issues come as a result of the two of you sticking to being “right” above all else and not opening to finding a solution that you both want. Whatever your issue, you can learn to act in a counter-intuitive way. We think you can relate that when you have some of these issues in your relationship, you close or shut down to your partner–even when he or she hasn’t done anything to deserve the distance. Closing down is automatic and certainly a normal reflex that many of us do when we feel threatened, misunderstood, or not loved. It’s just a way we learned, probably unconsciously and early on, to protect ourselves from pain–emotional or even physical pain. And closing down probably even served us at various times in our lives. You might do this because you fear that if you don’t “shut down,” you’ll feel or experience more emotional pain or intense feelings than you can deal with. Closing down to your partner can mean withdrawing love or attention, holding back part of yourself from your partner and even physically withdrawing. While closing down to other people may be the best thing for our well-being in certain situations, it doesn’t serve us if we want to stay in the relationship and make it better. When you close down, you shut the door on communicating and understanding one another. …then opening sets the stage for greater connection and a better relationship–which is counter-intuitive when you’re jealous. We offer quite a few ideas about ways to open instead of closing in our Relationship Trust Turnaround book and audio program that might help you understand a little more about it. *Openness or opening to another person doesn’t mean that you agree with or condone the other person’s behavior or even your own. *It doesn’t mean forgiveness–although openness is often a by-product of going through the forgiveness process and it’s also easier to be more open once you have forgiven. *Openness doesn’t mean that you’ve given in or given up your power or respect in this situation. So if it isn’t those things, what IS it? *Being open means moving toward and not away from. *Being open means allowing your emotions to be but not allowing yourself to be ruled by them. *Being open means listening from an objective place. *Being open means you are seeking information and that you still have choice. *Being open means allowing for the possibility of understanding one another. What do you have to do to begin opening to your partner–even in tough situations like jealousy, mistrust or a communication stalemate? You have to decide that holding back part of yourself isn’t getting you what you want and start making conscious choices about how you want to be in your relationship. That may include figuring out what you want and setting boundaries if the other person is violating agreements that the two of you have–and sticking to them. That’s a big statement, isn’t it? You have to realize that it takes a tremendous amount of energy to withdraw, separate and hold on to pain. With the same amount of energy, you can open your heart to at least listen to try to understand the other person–and to try to find a place that you both can agree. You may feel hurt by the other person–or even by someone you have been in relationship with in the past and you are carrying that hurt around with you every day like a ton of boulders around your neck. This isn’t healthy for you and it isn’t healthy for your relationship. 1. It starts with loving yourself and believing in who you are. If your self esteem seems like it’s non-existent, start noticing things that you do like about yourself. 2. Lighten up your thoughts about yourself. If all you are doing is tearing yourself down in your mind, it’s no surprise that other people may not value you the way you think they should. Change your thoughts about yourself to better ones. 3. Lighten up your thoughts about the other person. Remember why you love this person and don’t constantly repeat in your mind what you don’t love about him or her. 4. Know that you have choice. It may not seem that you have choice about your situation but you actually do. 5. Shift your attention to your heart as you listen to the other person and if your mind starts churning, bring your attention south. Find a place inside you where you know that you have choice and you are just listening to try to understand. 6. If you need to set healthy boundaries with this person, do so from a place of loving inside yourself–and from a place of knowing what you will and will not stand for. One other way you can get yourself and your partner to draw closer to each other and open more is by asking each other the right kinds of questions. The kind of questions we’re talking about here are ones that start deep meaningful conversations and help you get to know each other deeper and enjoy a richer and more loving connection no matter how long you’ve been together. We know that it takes courage to open. One of the best ways to find the courage to be open, even when it’s scary to do so is to consider the alternative. Consider what your relationship is like now and that it could and probably will deteriorate if you don’t at least attempt to open. You can certainly go through life defended and closed or you can gather up your courage and self-confidence and open to something really good happening.